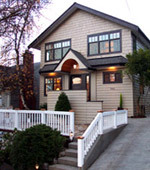 a large 5 bedroom home at the northern part of queen anne. to create an expansive, yet private, family residence while considering all of the elements of family dynamics. a combination of urban living and contemporary charm. a strong color palette was used to detail all windows, molding and built-in cabinetry. 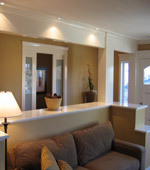 the main floor has a large living room with restored batchelder tile fireplace, formal dining room with metallic caupher ceiling, office with handsome glass panel pocket doors and family room off the large gourmet kitchen with built in breakfast nook, granite island and mud room with desk and storage area. 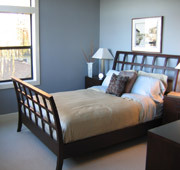 the second floor is light-filled with four spacious bedrooms, laundry room and 2 baths. private master suite is designed with classic contemporary touches giving it the feel of an urban boutique hotel feel with spectacular view and deck. lower level is a family media/rec room with 2 additional rooms, large full bath, small second kitchen and private entrance.